Let me start this review by saying that this is NOT a space rock album. I picked up this CD, and am reviewing it here, based solely on Porcupine Tree's Steven Wilson's involvement. Having said that, there is a lot on Blackwater Park to like, if you're a metal fan who likes more than just crunching power chords. Imagine a blend of progressive rock, dark wave folk, and death metal, and you will get an idea of what Opeth sound like. This is the Swedish outfit's fifth full-length CD, and features Steven Wilson not only helming the production controls, but contributing vocals, guitar, and piano. So does Wilson make Opeth sound like Porcupine Tree? In places perhaps, but that cannot be solely attributed to his influence. 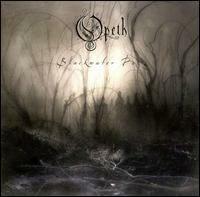 Opeth crafts a brand of heavy metal that is strong on the progressive side. Nor are they afraid to bring acoustic instruments into their death metal sound. In fact, just about every song on Blackwater Park has acoustic breaks, and two of the songs, the lovely Harvest, and the haunting instrumental Patterns in the Ivy, are entirely acoustic. Harvest, in fact, is a song that would not at all be out of place on a PT album. Wilson also adds interesting electronic effects, like the weirdly processed guitar at the end of Bleak, and the spacey (yes, spacey) textures on the title track. But Opeth is definitely heavier than PT, and features very little in the way of keyboards (Wilson adds atmospheric piano here and there to nice effect). Then there's also the guttural, growling, death metal vocals. If fans of Porcupine Tree can get past that, they might find themselves enjoying this album a lot. Not all the vocals are of the death metal variety, however. Micheal Åkerfeldt is a talented singer who can growl with the best of them, but also sing melodically, with passion and deeply felt emotion, and he often sings in both styles within the same song. And Steven Wilson's added vocals and harmonies on Bleak make it one of the stronger tracks on the album. Instrumentally, Peter Lindgren gets a lot of range from his guitar, from intense power riffing, to clever and melodic solos (especially the slow, extended moody breaks in Dirge For November and the title track, the soaring solos of The Funeral Portrait, and the Middle Eastern sounding fretwork of Bleak). Martin Lopez can pound out a good n' heavy beat on the skins, but is also capable of some complex rhythmic structures that border on jazz. Martin Mendez's bass throbs with wild abandon, and truly shines on the final, title track. This is a band that is starting to get a lot of notice on the international scene, and is well worth checking out. For more information you can visit Opeth's official web site is at: http://www.opeth.com/.